This recipe is inspired by baingan ka bhartha – roasted and peeled eggplant with spices. I was actually making bhartha, but last moment, I added a little twist to it by adding avrekaLu. It made a very tasty and quick side dish. Cook avrekaLu and keep aside. Roast eggplant(like in this recipe). Peel the skin. Crush the coriander seeds, do not make the powder very fine. Heat oil. Add mustard seeds, cumin seeds, curry leaves. When they are fried, add crushed coriander seeds. Add tomato, chilli powder, salt and cook for few minutes. 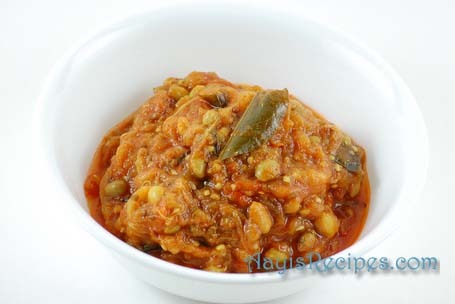 Now add cooked avrekaLu, eggplant, cover the lid and cook for few minutes. Serve hot. I love eggplant bharta! my mum made a killer version. I really find your combination with the beans intriguing! wow thatz a real good twist with the bharta. Hello Shilpa – Love Avare Kaalu. This is a very good idea. A great way of making baigan bhartha more interesting! I have posted a write up on the avare mela at Bangalore. Check it out some time! Wow!! This is truly a interesting recipe! Iam coking this for dinner tonight with rice. Very innovative. What a good way to use avrekalu. This is nice twist to the Bhartha. It looks delicious. Shilpa, this bharta looks too good, I will certainly try it soon. Could you tell me what exactly is Avrekalu? I just want to make sure I get the right thing from the grocery store and how long did it take for you to cook it? Thanks. Shilpa: Did you click the link for avrekalu? this is a intresting as well as healthy combo Shilpa….will try sometimes soon. Wow.. this recipe has come just in time and looks sooo yummy. I have a smoked eggplant sitting in my fridge ready to be cooked. I cooked it in the oven instead of the stove (just making it easy for myself with cleaning and stuff). I did not know that Val was the same thing as surti papdi. I love val and will def. give this a try. Is Val available readily in US markets? Shilpa: It is available in our local Indian store. So check in Indian store close to u. Nice recipe. Good to know that u r using less coconut in the recipes now. Thts good. I was searching for val on net and i found this.http://en.wikipedia.org/wiki/Edamame.Is this and val both the same? ?If so i can check it in chinese market.I may find the fresh ones there.so please let me know. Shilpa: They don’t look same. I am a frequent visitor to ur site and always wished to write a response. Have tried many of ur recipes and there r no words to speak.awesome. I tried this dish last week and it was so good, i cud hardly stop myself from eating it(cos i dont like brinjal at all :-)). This recipe is too good. Ur site helps me a lot to learn cooking. Thanks a lot.